Assume that anything that you post online that is made visible to the public (i.e. not hidden behind a login or a paywall) can be copied, scraped, ripped, downloaded or otherwise taken from your website’s pages with relative ease. This includes but isn’t limited to YouTube videos, images, text on pages, file downloads, etc… Protecting website content seems like a gargantuan task given that some of the culprits responsible for ripping off images, information, and media aren’t event located in the same continent or subject to the same intellectual property laws. By virtue of design, the interaction between browsers and websites create opportunities for anyone to copy content but this doesn’t necessarily mean that you shouldn’t upload anything at all (otherwise nothing worthwhile would get posted). After all, the raison d’être of your public website is to serve your visitors and your customer base. 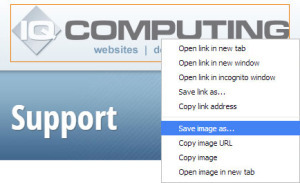 Preventing Image Copying Right-click scripts and fancy search-engine-unfriendly Flash approaches to keep images out of the hands of those who would dare to copy your page content are only effective against the most primitive of users. We’ve also seen a wide variety of CSS layering and other creative techniques but these seem to cause more problems that they solve with respect to browser availability. The best solution that we have found is to ensure that complex (but discrete) watermarks are placed on images either automatically or manually such that uploaded images would require a great deal of Photoshop manipulation if a visitor wanted to remove them for nefarious purposes. Videos & Video Streaming When it comes to displaying videos on your website, most often the fastest and widest reaching choices tend to be automatic YouTube or Vimeo embedding. With automatic device detection and smooth content buffering, these services are the most commonly used approaches to delivering video media to website visitors however the downside with these services is that anything posted on YouTube or Vimeo can be ripped with the right set of tools. If you’re looking at protecting website content that features video feeds, using free public streaming services isn’t the right solution. To summarize, the inherent nature of the web today is about publishing, distributing, indexing, and finding information. Steps taken to try and prevent one or more in the interesting of protecting website content against scraping or copying can incur unintended consequences (whether it be unintentionally making it difficult for visitors to use your website or even raise red flags with search engines as some of these techniques can be misconstrued by search crawlers as black hat or spam-oriented in nature). Watermark your images (and even your videos), write great content, and make your website reflect the quality and authority of what you have to say.